S.T.E.M. Night at PK Park! 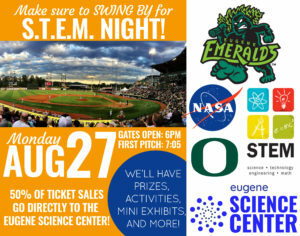 Description: 50% of ticket sales go directly to the Eugene Science Center! Doors open at 6, Game starts at 7:05! We’ll have prizes, activities, mini exhibits, and more!